Schools are a service industry. In service industries, the business, processes, administration, daily functions are run by people. And schools are serving to educate the child. Hence, tools that are used in a service oriented business are of utmost importance, especially when it comes to the tools used in interacting with their customers which are, in this case nobody but the childrenâ€™s own parents. These tools of interaction are basically the medium through which the parents can feel ascertained about the childâ€™s progress at the school. The medium through which the teacher can unfailingly coordinate with the childâ€™s parent with regards to the childâ€™s daily and upcoming activities. This medium sounds cost-incurring but for schools and parents, it comes totally free of cost. Itâ€™s nothing but a simple app. A free school communication app that not only simplifies the teacherâ€™s life, but also the kidsâ€™ and the parentsâ€™ life. 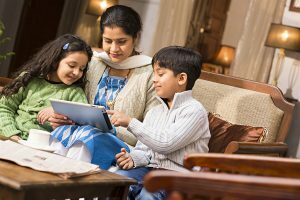 There are several hundred apps for schools in India available but itâ€™s important to search the best one out of those that clearly defines and delivers the goals of a good parent-teacher communication app. In a technology-driven time, schools in India need mobile app to communicate with parents. And more so, this technological shift has not been of recent, but has been existing since a long time. Free school communication apps is the next big thing that schools need to look up to. One of the most important reasons as in why schools need to do this is that social media and online entertainment content has become an undying habit for the people. A message from a parent teacher communication app sent by the teacher to the parent, just interrupts the parent to divide their attention for the kid and take a glimpse of the kidâ€™s conduct at school. This ensures that the kid is overlooked not only by the teacher but also parent because itâ€™s undeniable that raising a kid is each of their responsibilities. As and when, through the free school communication app, the parent even takes a heed at what is it that their kids are upto. Subtly, this also becomes one of their habits, but a good one as compared to the habit of simply and endlessly scrolling down the social media pages. The apps for schools in India ensure that parents share a vital responsibility with the school in raising and educating the child. Below are the reasons of feasibility in implementation of such a parent-teacher messaging platform. Some of the best available apps are for free. Applications like Teno which is the new fad among India schools is not only the leading communication app in India but is completely free of cost. These free school apps are as easy to use as Whatsapp. Moreover a watsapp for schools i.e a dedicated platform designed to be used for school based communication. School based communication applications don’t need a maintenance program Unlike a complicated ERP solution for a school which comes with a mandate maintenance setup that needs skilled resources, to run the application smoothly on daily basis. A free school app is loaded with a wide variety of features such as, send pictures & videos, teachers can share one-to-one feedback with parents, emergence alarms, send voice messages, and so on and so forth. Schools need to feel rest assured to implement this because there are multiple options of free school communication apps to choose from. But what matters most is that a good parent-teacher communication app needs to be in place for the right, smooth and effective communication to happen between the parent and the teacher. Gone are the days of giving a remark on the studentâ€™s calendar, registering complaints and to open the complaint box in the open house in front of the parents. Gone are the days to use papers, books or anything that costs natural resources. Itâ€™s technology and itâ€™s free school communication apps that are developing by leaps and bounds, and being looked upon as the next big change. Interesting happy anniversary card my dear. These variations are really appropriate in the article. Thank you for sharing this beautiful post. These are nice happy anniversary messages. Appreciate you for sharing. I just want to tell you that I am just newbie to blogging and site-building and certainly loved you’re website. Most likely I’m going to bookmark your site . You definitely come with fabulous article content. Thank you for revealing your website. I simply want to mention I am just all new to blogs and certainly enjoyed this web-site. Most likely I’m going to bookmark your website . You really have terrific writings. Regards for revealing your web site.